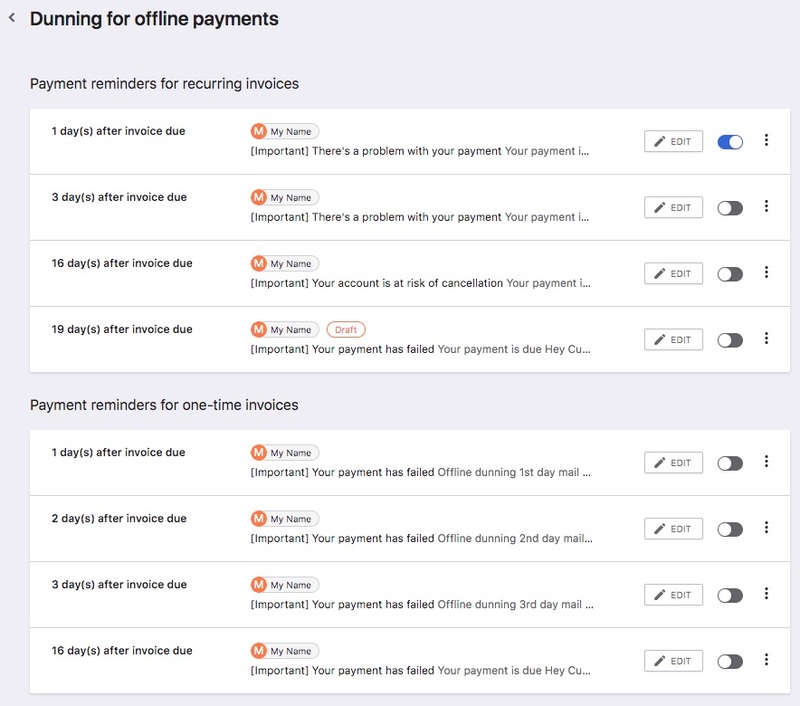 Chargebee provides dunning option for customers whose payments are collected manually, i.e., for subscription with Auto Collection turned OFF. 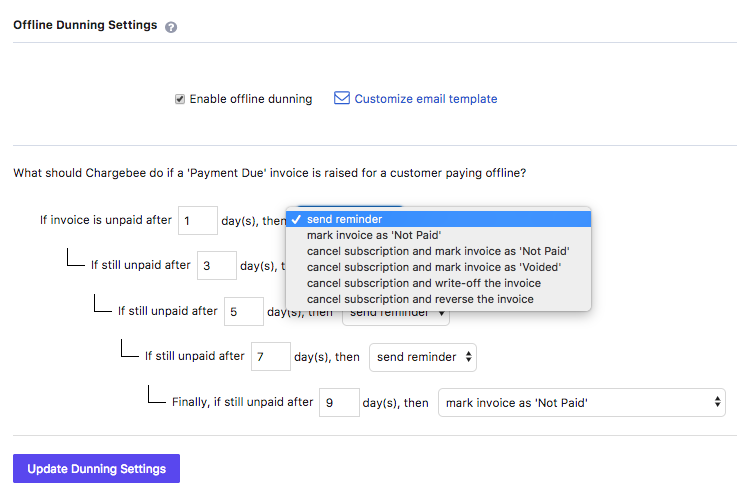 You can configure Chargebee to send reminders to the customer when a Payment Due invoice is generated for them, and also configure the action to be taken should the customer fail to pay. Each reminder is sent X days after the last reminder was sent to the customer; X being the number of days that you configure. If offline dunning is enabled for a customer and subsequently the Auto Collection option is turned ON for them, Chargebee will stop dunning. If an invoice has been partially paid, it cannot be marked as Voided or Not Paid (if configured under Dunning Settings), but the subscription will be canceled. Checking the box Enable offline dunning is the first step on getting offline dunning set up for your Chargebee site. The next step is to set up Email Notifications for sending email reminders to your customers about the payment due. Customers will receive email reminders from Chargebee about the payment for the invoice marked payment due. You can configure the emails based on the version of the Email Notifications enabled for your Chargebee site. If you have Email Notifications V1 enabled for your Chargebee site, you can send up to 4 reminder emails to your customer. The emails will be sent in the intervals defined in the offline dunning settings. Refer Dunning management to know more about the dunning settings. To configure emails for your customers, click on Customize email template and you will find the template you can edit. If you have Email Notifications V2 enabled for your Chargebee site, you can configure more than one email reminders to be sent to your customer. 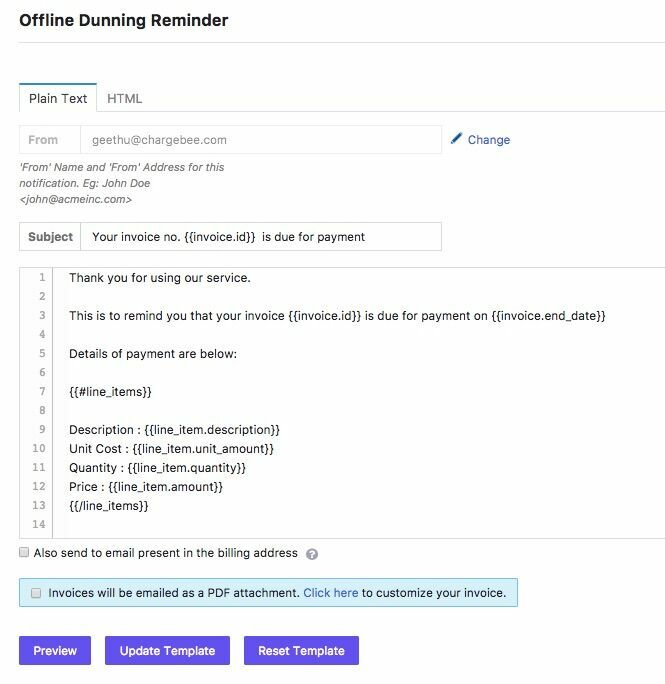 In the ‘Offline Dunning Settings' page, you can define the dunning period and the final action for the unpaid invoice. You will find the default emails here. Refer Dunning Email Notifications Settings to know more on how to configure emails for dunning with Email Notifications V2 enabled for your Chargebee site. Unchecking Enable offline dunning will disable Offline Dunning and reminder emails will no longer be sent to your customers. The change will be reflected on invoices generated after the option is disabled. Invoices that were generated when offline dunning was enabled, will continue to remain in dunning state. You need to manually stop dunning for such invoices.